Silly Sir Brewing Co.Silly Sir Sara's Cider - Silly Sir Brewing Co.
December 7, 2015 - No Comments! Well really, this cider has very little to do with Silly Sir because Sara did 90% of the work (although we are a team). She decided to make a cider today using about 10 crushed apples, cinnamon sticks, a whole nutmeg seed, and cloves, as well as a couple oranges and a bit of brown sugar towards the end. "It smelt great!," Sara just said two seconds ago. 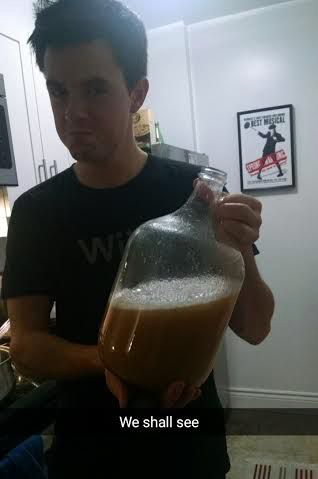 It only yielded about half a gallon of cider, which was somewhat disappointing. Initially it was just going to be a regular cider, but I suggested we ferment it to give it some punch. True to Silly Sir form, we experimented and messed around without caring too much about the end result because there's so much learning that goes on through experimentation (I'm a scientist at heart). We used a bread yeast rather than an ale yeast which according to research could produce a "bready" cider depending on the brand. Regardless it should flocculate (drop out) nicely, and if we let it clean itself up for a couple weeks, it should taste crisp and clean. I'm excited to see how this tastes.